From the time Jake and I rented our first apartment in Maryland, I've enjoyed creating simple centerpieces for our dining room and kitchen tables. I certainly have no idea what I'm doing what it comes to arranging flowers or even pairing pieces the way a stylist would. Oh, how I love looking through the incredible arrangements that professional stylists put together on Style Me Pretty. I'm amazed by their gift to pair together often-times ordinary things to make something extraordinary. I'm a far cry from these guys, but it doesn't stop me from attempting to beautify our home in little ways. 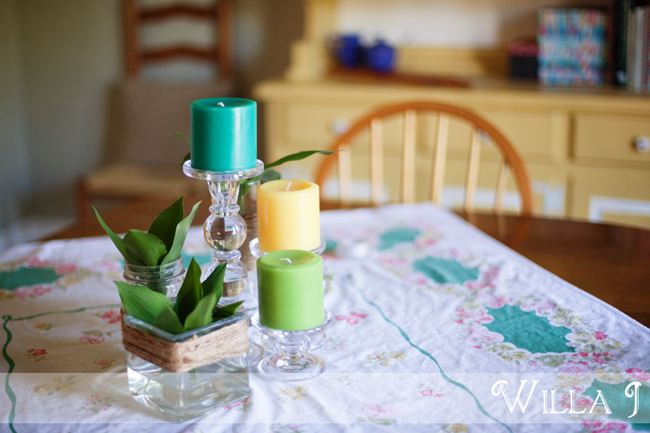 So, when I saw these very reasonably priced glass candle pillars at Target, I snatched them up to create a colorful and inexpensive centerpiece that can hang around all Summer long! Have a wonderful Memorial Day weekend!